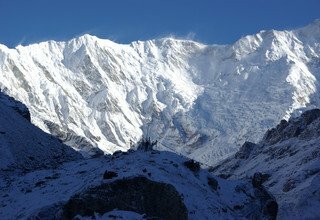 Kanchenjunga Base Camp Trek is one of the great Himalayan trails, which covers the eastern part of Nepal. 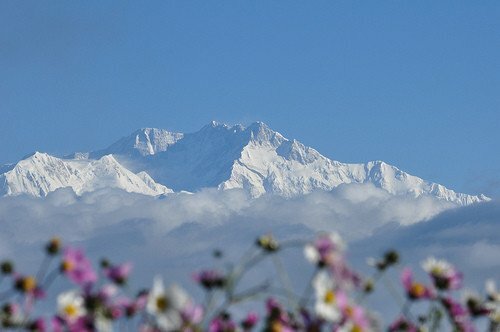 The term “Kanchenjunga” stands for crystal clear in Nepali. 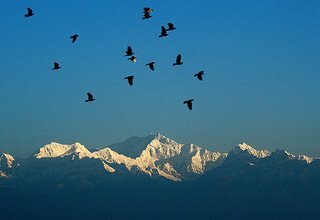 Kanchenjunga (8586m) is the third highest mountain in the world and is also popularly known as the “Five Treasures of the Great Snow” i.e. Gold, Silver, Precious Stones, Grain, and Holy Scriptures. 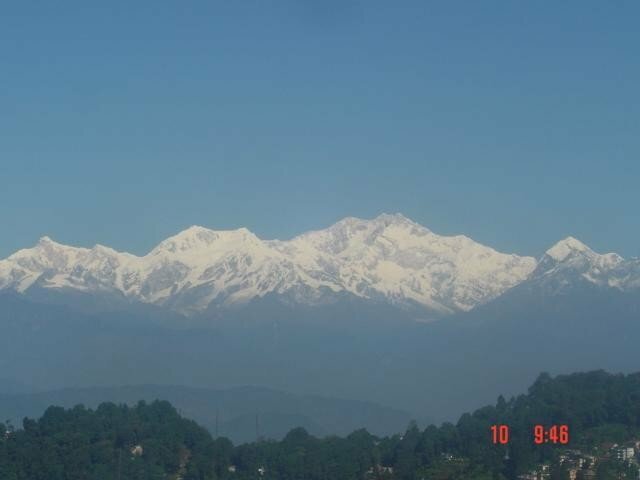 The famous Kanchenjunga is situated in North-East Nepal and is bordered by Sikkim, India. 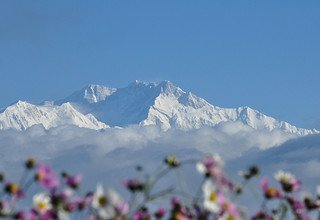 Since the mountain partly lies in Nepal and partly in India, the view of Kanchenjunga can be seen from India, Bhutan, and Tibet. 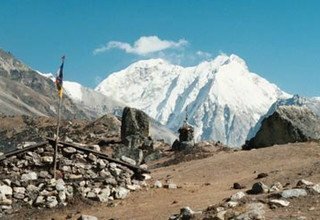 The trekking route to Kanchenjunga Base Camp passes through the Arun valley which is considered the most beautiful regions for trekking in Nepal. 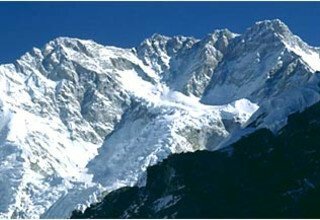 One of the main highlights of this trek is Kanchenjunga Conservation area which covers an area of 2035 square kilometers. The area is home to many flora and fauna as well as various wildlife including Himalayan black bear, musk deer, snow leopard, red panda, wild boar and many others. 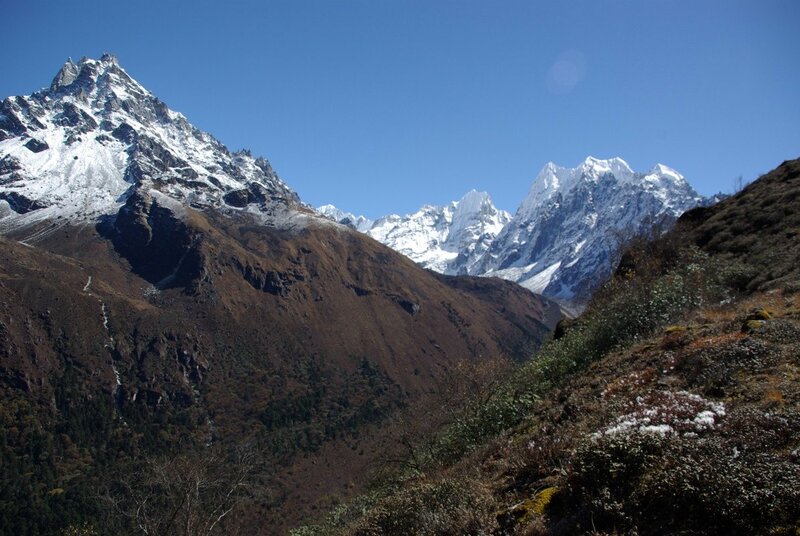 The route to basecamp offers variations in landscapes from alpine grasslands to sub-tropical forests, low river valley, glacial moraine, and rocky scree slopes. 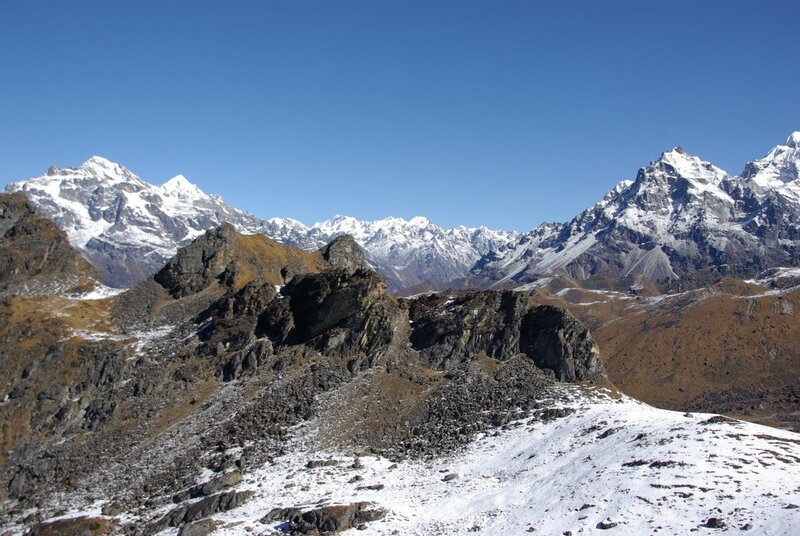 Throughout the trekking, trekkers get to relish the stunning panoramic view of the massive mountain peaks such as Lhotse (8516m), Everest (8848m), Kanchenjunga (8586m), Makalu (8481m), and many others. 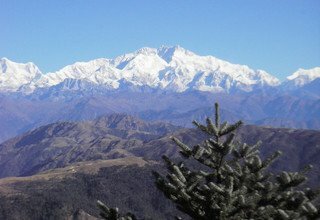 The Kanchenjunga region is inhabited by a mixed community of Sherpa, Rai, Limbu, and Gurung, which provides an opportunity for trekkers to understand their culture and lifestyle. 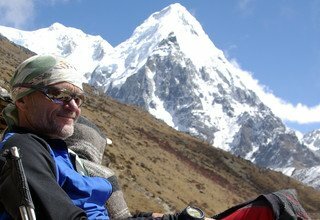 Swiss Family Treks and Expedition is one of the most trusted travel companies in Nepal while having worked in the tourism since 2002. We make sure your travel in Nepal is special and memorable. We acquire all kinds of legal permits for your travel in the country. We assign you a local English speaking guide so that you can make the most out of the trip. We get you the best accommodation in the area to make your stay a comfortable one. 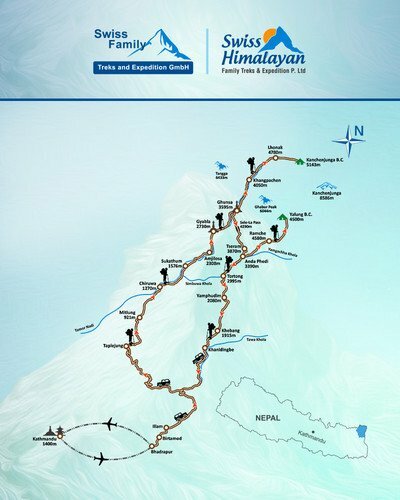 So, remember us if you are planning for a trip to the Himalayas. We catch early morning scenic flight to Bhadrapur. After landing, we take a jeep ride to Ilam enjoying the view of beautiful landscapes. Ilam is Nepal’s largest tea plantation area and serves as a major tourist area even for domestic tourists. The picturesque town of Ilam hosts large orchards of tea plants and is also famous for the Himalayan chew made of cheese. Overnight at hotel in Ilam. Today, we head towards Taplejung in private transportation. Driving along the beautiful countryside view, we pass through Phidim to reach Limbu village of Taplejung. Overnight in Taplejung. 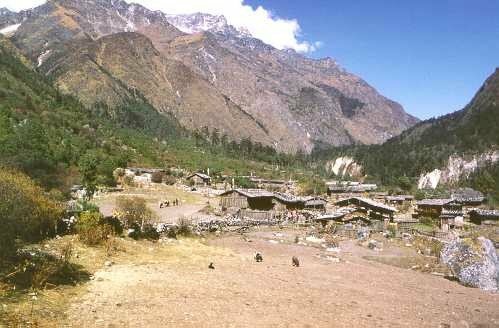 The trekking route today passes through lush mid hills and several villages with traditional mud-brick houses. We also come across rice paddies, terraced farm fields, and cardamom farms. 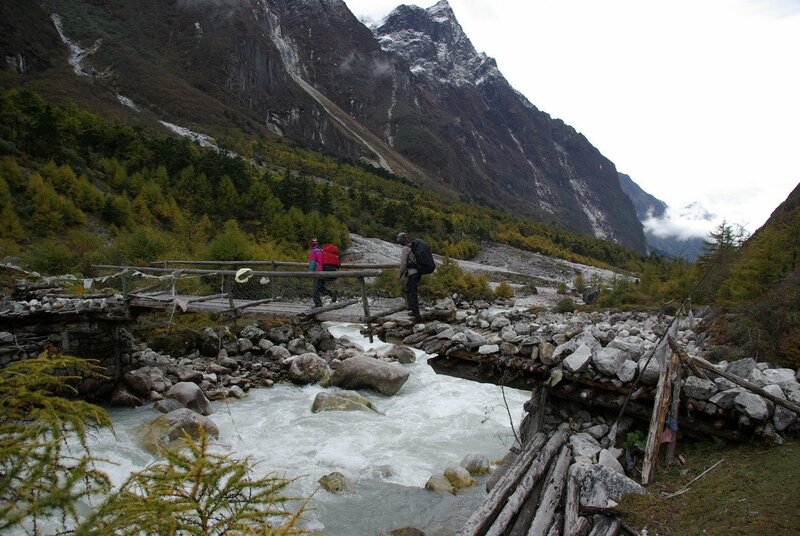 We then continue to trek following the flow of Tamor River to reach Mitlung. Overnight in Mitlung. Today we trek through the Limbu and Tamang villages of Sinwa, Tawa, and Porke. 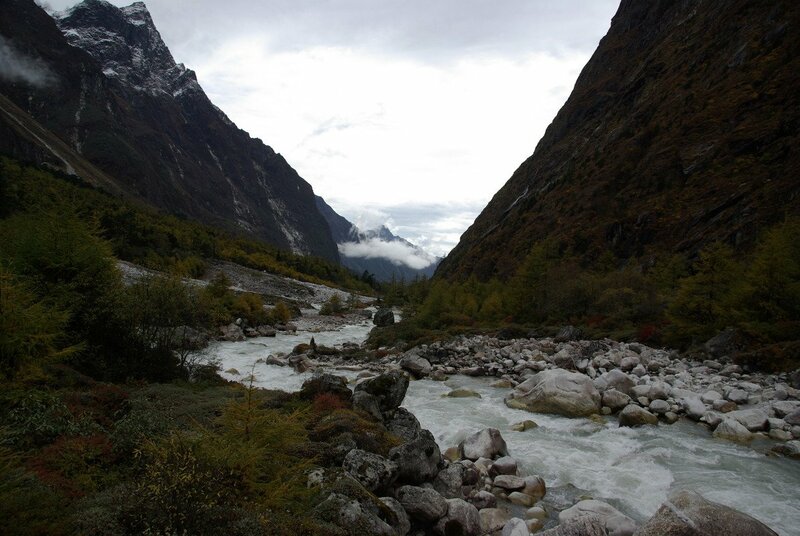 We also pass over old landslide debris and boulder, and strewn river deposits, before descending to Thiwa Khola. We then cross a wooden bridge to reach Chiruwa. Overnight in Chiruwa. Trekking through the villages of Taplethok, Tamewa, Hellok, and Lelep, we move alongside Tamor River and descend towards Simbu Khola, which emerges from the Yalung Glacier. 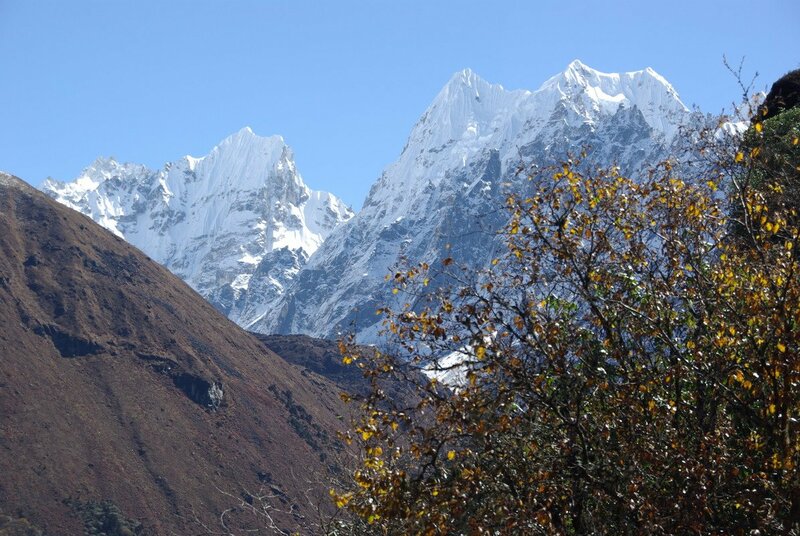 We then trek through steep and narrow Ghunsa Khola valley to finally arrive in Sukathum. Overnight in Sukathum. Moving with the flow of Ghunsa Khola, we head towards Amjilosa walking through steep uphill on exposed terrain. Relishing the amazing landscape view and crossing several bridges over Ghunsa Khola, we reach the Tibetan village of Amjilosa. Overnight in Amjilosa. 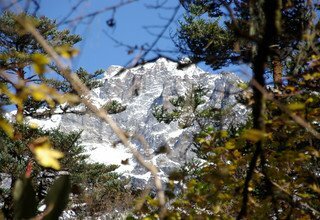 Today, we walk through forested trail filled with rhododendrons and bamboo, before ascending to Gyabla. We also come across a big waterfall on the opposite side of the river on our way to Gyabla. Making a steep ascent and then a descent, we arrive in Gyabla. Overnight in Gyabla. 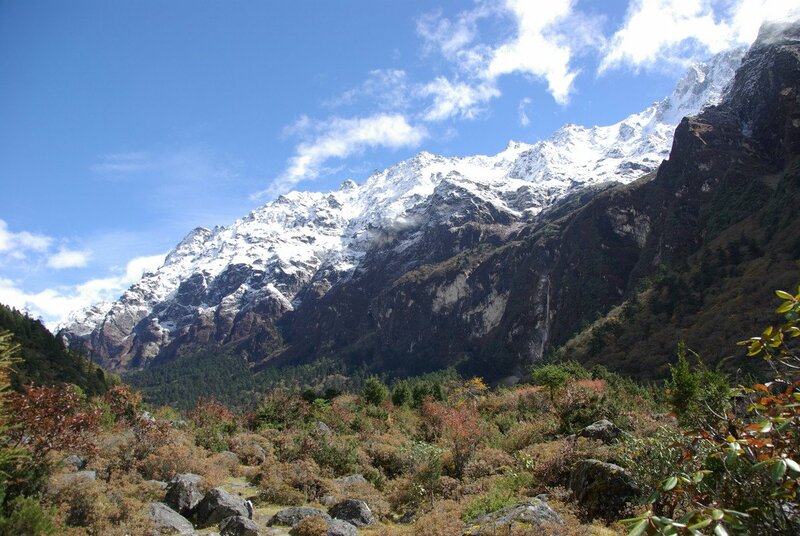 Leaving behind the beautiful Gyabla village, we trek towards Ghunsa through a broad meadow. We then climb a small hill and descend to cross the river to reach the Tibetan village of Ghunsa with wooden houses, a micro hydropower plant, school, and a health post. Overnight in Ghunsa. To adjust with the thinning air, we take a short hike to the opposite side of Ghunsa Khola with a gain of about 400m. After returning from the hike, we can spend rest of the day exploring the ancient village of Ghunsa visiting monasteries and learning about their Buddhist culture and tradition. Overnight in Ghunsa. 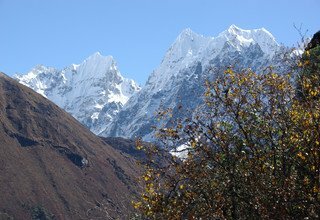 Today, we begin our trek entering the forested path along the south bank of Ghunsa Khola and passing several Mani walls and Chortens along the way. We also trek through several scree slopes and some glacial moraines to reach the Tibetan settlement of Khangpachen from where we can get the stunning view of the north face of Jannu (7710m). Overnight in Khangpachen. 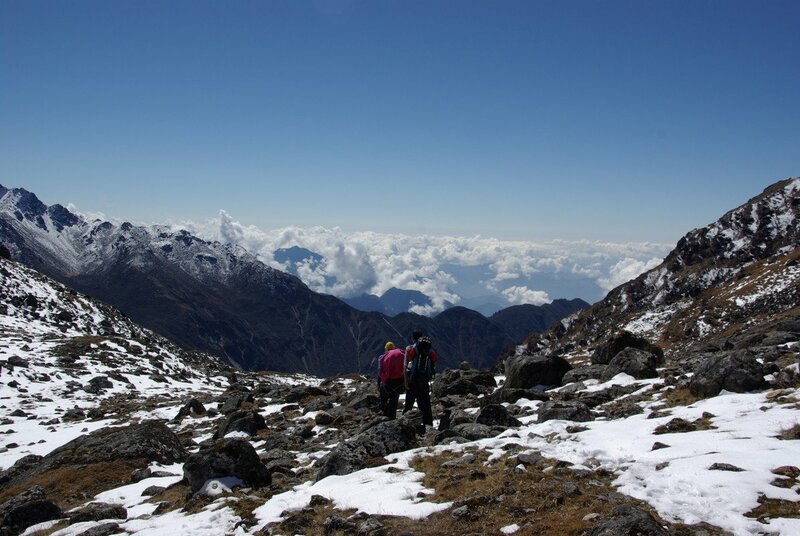 Leaving behind Khangpachen, we follow the trail on the left side of Kanchenjunga Glacier. 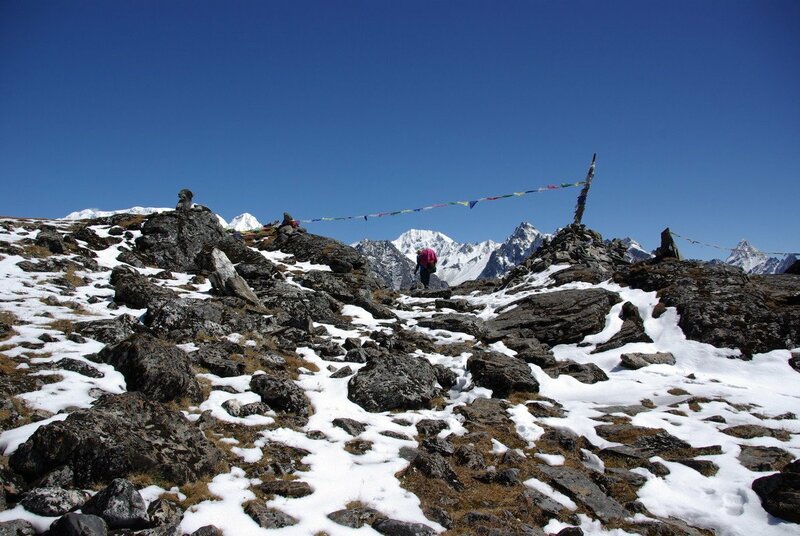 We hike along a high plateau to reach the campsite of Lhonak. From Lhonak, we can see the panoramic view of massive mountain peaks like Wegde Peak (6802m), Mera Peak (6364m), Nepal Peak (7177m), Twins (7350m), and many others. Overnight in Lhonak. 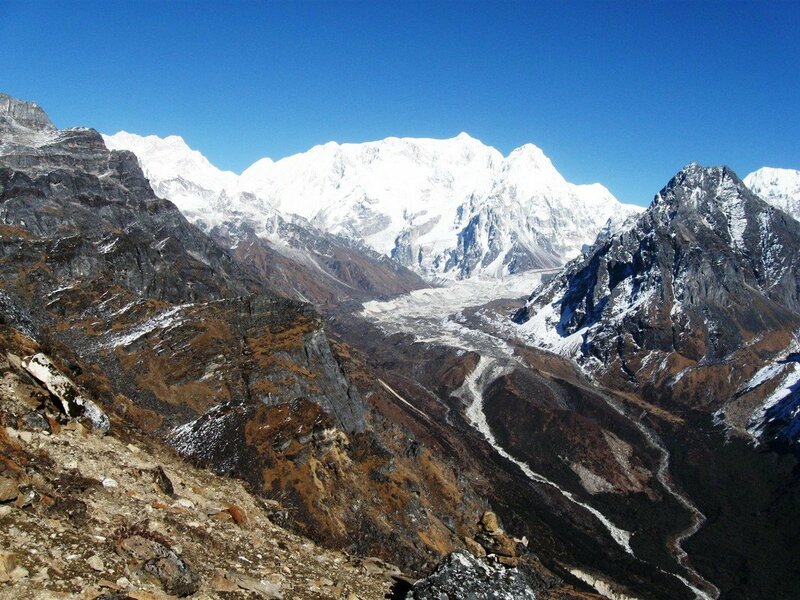 Today, we head towards Kanchenjunga Base Camp following the trail along the glaciers on the northern ridges. 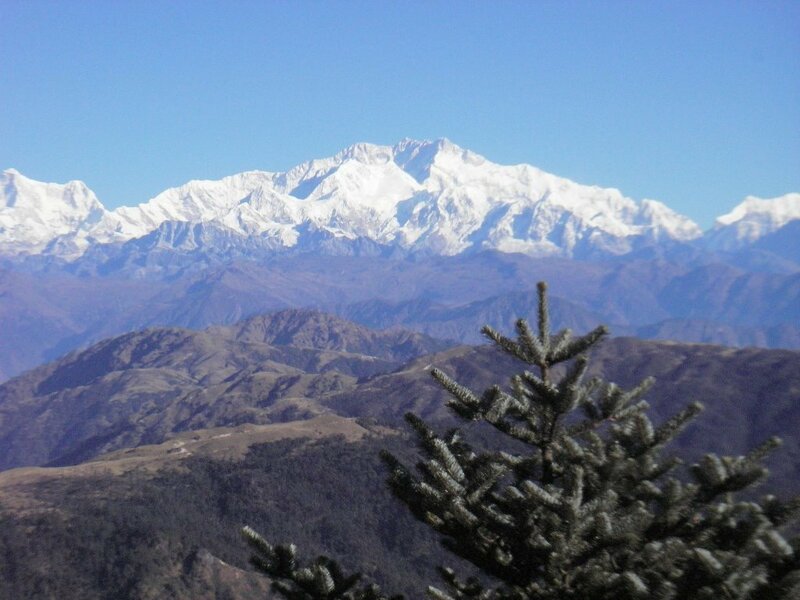 The camp is also known as Pang Pema from where we get the mesmerizing and spectacular view of Mt Kanchenjunga (8586m) along with the skyline filled with snow-capped mountain ranges bordering Nepal-India and Nepal-Tibet. 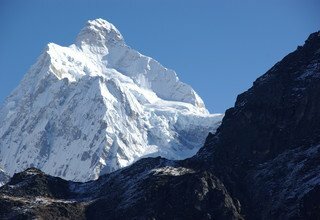 Overnight in Kanchenjunga Base Camp. After the amazing experience in KBC, we retrace our trail to Ghunsa enjoying the spectacular view of different mountains. Descending past Lhonak and Khangpachen while walking on the moraines of Kanchenjunga Glacier and Kumbhakarna Glacier, we arrive in Ghunsa. Overnight in Ghunsa. 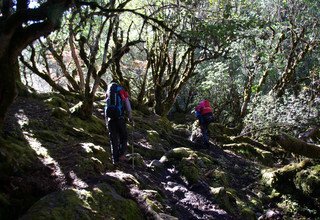 To reach the High Camp, we trek along a steep rocky trail through a forested area filled with birch, pine, and colorful rhododendron. An amazing view of Jannu (7710m), Nyukla Laching (6670m), Temachunggi (6044m), and other mountains can be observed from High Camp. 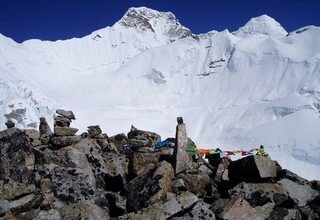 Overnight in High Camp. Today might be the most challenging day as we cross over two passes on our way to Tseram, the highest pass being the Sele La (4480m) and Sinion La (4660). 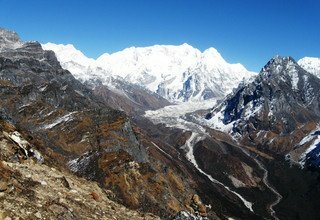 Upon reaching the top of the passes, we are rewarded with an amazing view of Yalung Glacier, Jannu (7710m), Makalu (8481m), Baruntse (7129m), Kanchenjunga (8586m), and many other mountain ranges along the Sikkim border. 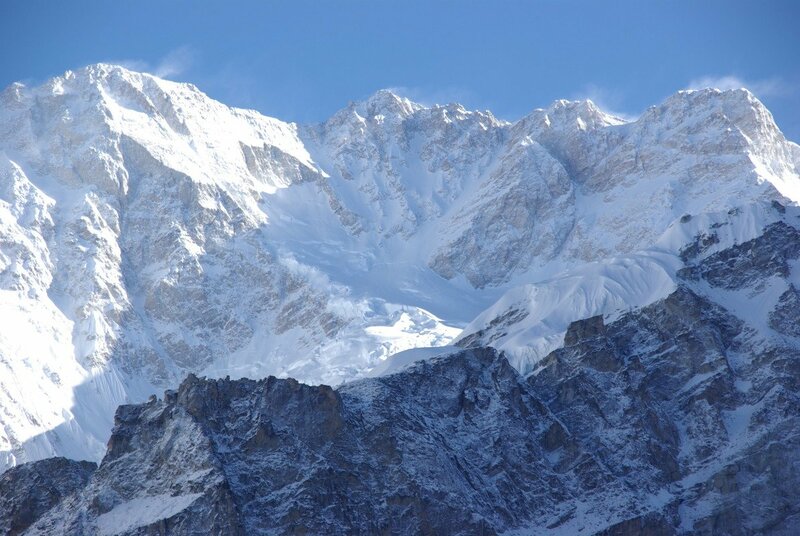 We then descend to Tseram for an overnight stay. 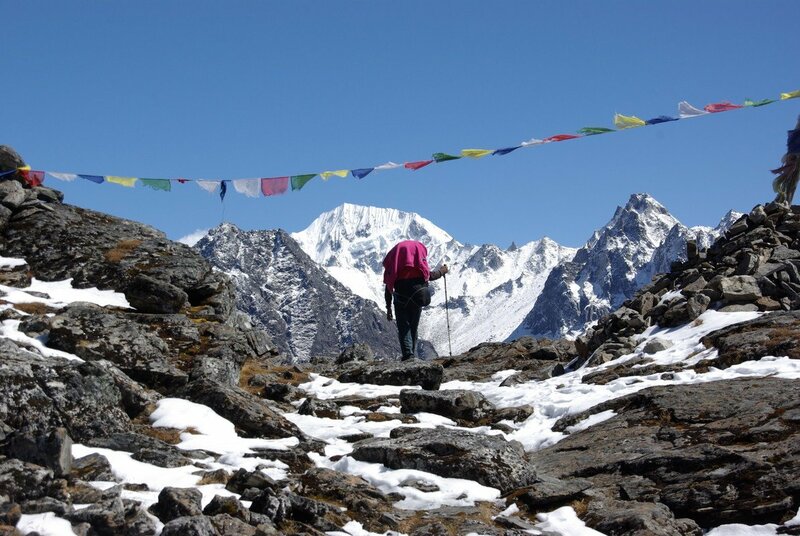 Passing the moraines of Yalung Glacier into an ablation valley, we ascend towards Ramche. We also come across a lake and a meadow where we can spot the blue sheep grazing on the grassy hills. We will visit the small monastery in Ramche, in the evening. Overnight in Ramche. 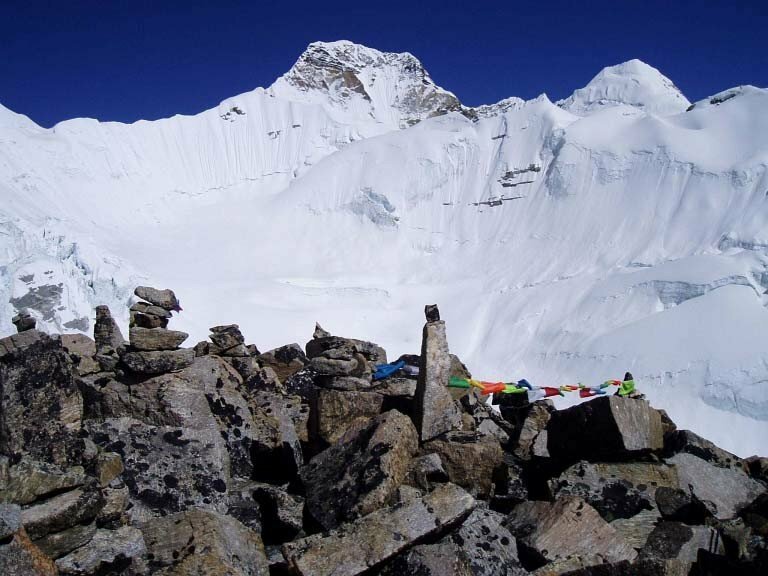 Today, we explore Yalung Base Camp area. Trekking through the glacial moraines and challenging rocky path, we cross Oktang, from where we can get a panoramic view of Jannu (7720m) and Kanchenjunga (8586m), and several other peaks. We return back to Ramche for an overnight stay. 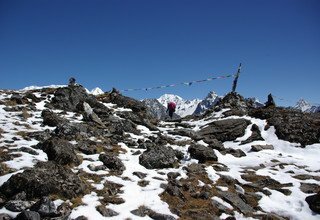 Retracing the same trail, we trek towards Anda Phedi relishing the view of different mountain ranges and herds of blue sheep over the grassy slope. 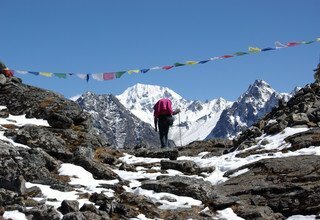 Descending through the moraines of Yalung Glacier, we walk past Lapsang and Tseram to arrive in Anda Phedi. Overnight in Anda Phedi. 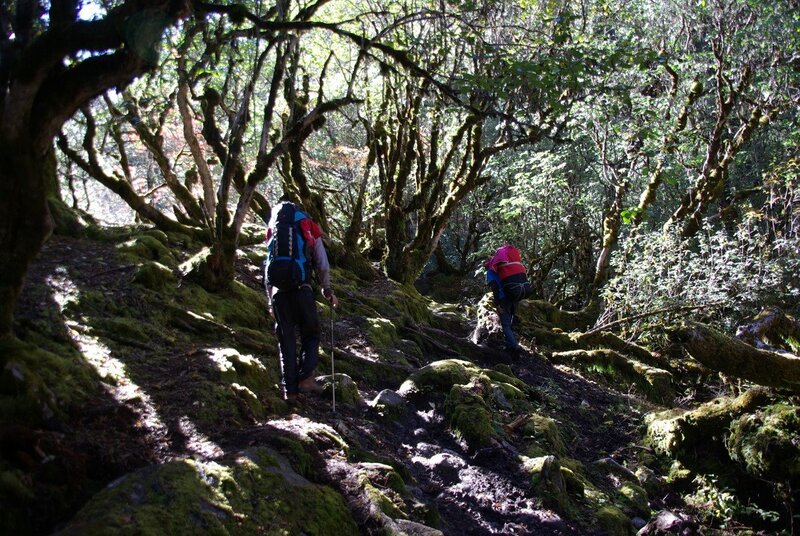 We descend towards Tortong through the densely forested path filled with rhododendrons and bushes. 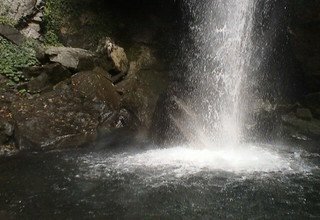 We also stumble across few streams, Chortens, monasteries, ponds, and waterfalls on our way to Tortong. Overnight at Lodge. Leaving behind the village of Yamphudim, we descend towards Khebang passing through valleys, waterfalls, and forest area. Crossing suspension bridges over several streams, we walk past small settlements alongside Kabeli Khola to arrive in Khebang. Overnight in Khebang. Accompanied by the beautiful view of Kanchenjunga (8586m) and Kumbakaran/Jannu (7710m) in the background, we continue to trek towards Khanidingbe through lushly forested trail stumbling across several waterfalls along the way. Overnight in Khanidingbe. 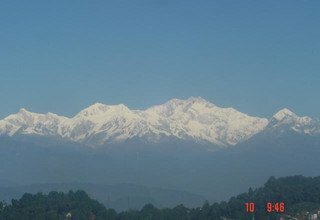 We take a long drive to Birtamod enjoying the view of green hills, snow-capped mountains, rivers, and daily activities of the locals throughout the ride. 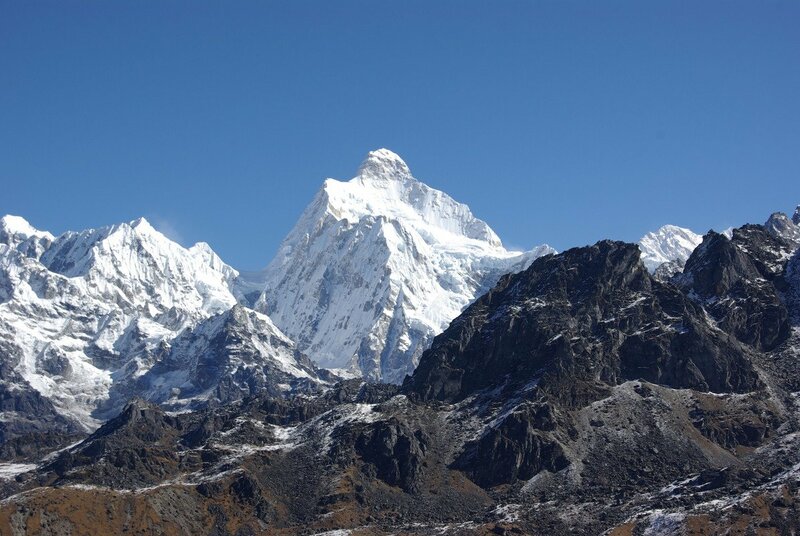 From the mountainous part, we are now in the flatlands of Nepal. Overnight in Birtamod. We drive towards Bhadrapur airport to catch our flight back to the capital city. Enjoying the aerial view of the mountains, we arrive in Kathmandu. After landing, we transfer you to the hotel. Overnight at a 3-star hotel in Kathmandu. We drop you at the Tribhuvan International Airport for your final departure with a hope of seeing you again. Are you also interested? Then Join a Group, we have 1 participant confirmed. * 4 nights accommodation with breakfast at 3*** hotel in Kathmandu and standard hotel in Ilam and Birtamod. * All flights; Kathmandu-Bhadrapur-Kathmandu and airport tax. 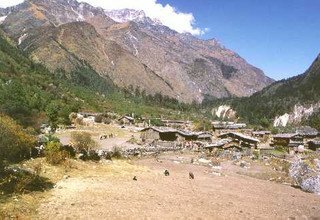 * Home-Stay/Lodge accommodation during the trek. 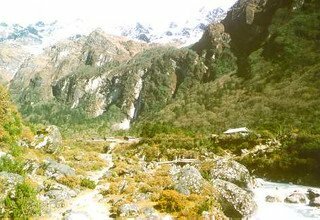 * 1 experienced, helpful and friendly guide, porters (1 porter for 2 peoples), their food & accommodation, salary, equipments and insurance. * Kanchenjunga Restricted Area permit. * Any meals (Lunch and Dinner) other than breakfast in Kathmandu. * Personal trekking equipments like sleeping bags, jackets and so on.